Gunny, a devoted Peninsula Beverly Hills guest, often visits the posh hotel, and the staff joyously greets him as he strides along the lobby’s marble floor. Retiring to his room, Gunny finds a specially monogrammed towel beside his Simmons Beauty Rest mattress (covered in 300-thread-count sheets) and sits down to a grilled New York sirloin and scrambled eggs with aged Tillamook cheddar on bone china. And when he needs styling, the hotel’s Rolls Royce shuttles him to the salon. All pretty normal for a 5-star hotel—except Gunny is a golden retriever. “Like their owners, pets should have a chance to get away from their normal routine,” said the hotel’s chef concierge, James Little. It’s not uncommon for a hotel to be pet-friendly these days. After all, according to one recent survey, 56 percent of pet-owning Americans travel with their furry friends (43 percent who keep them home report feelings of guilt). “America is more pet obsessed than ever,” said Andrea Arden, pet expert for the Today Show. “We see them as part as part of the family.” But some luxury properties go to such extremes to cater to pets that the line between man and man’s best friend is a bit, well, fuzzy. Pet bathrobes, pet massages, and pet treadmills are becoming practically de rigueur at five-star hotels these days. The Don CeSar Beach Resort in Florida, for example, offers a 60-minute canine massage, while Vermont’s Spa at Topnotch has doggy Reiki. Hotels are also competing for Fido’s affection with food. The Conrad Chicago offers a Kobe stew, while Aspen’s Little Nell features grilled salmon. But some of these programs are focused on giving back as well. 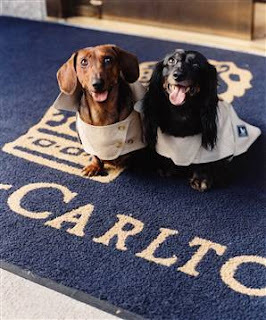 With each pet visit, the Fairmont Washington, D.C. and the Fairmont Royal York in Toronto donate to the local animal rescue or humane society. “Guests like helping less-fortunate animals who are not able to stay in hotels,” said Diana Bulger of the Fairmont in D.C.